Making surfaces oil repelling with a coating of tannic acid! Featured Image: Adapted from Chen, Y.; Meng, J.; Zhu, Z.; Zhang, F.; Wang, L.; Gu, Z.; Wang, S. Langmuir 2018, 34 (21), 6063-6069. Copyright 2018 American Chemical Society. Imagine that you are cleaning up a giant oil spill in the middle of the Gulf of Mexico. As you drive your boat around the floating patch of oil to begin cleaning, you look behind the boat and see a stream of oil trailing behind you. You realize that the floating oil is sticking to the metal sides of your boat, just spreading the spill further! Designing coatings that are oil-repellent (or “oleophobic”) can help prevent this secondary spread of pollution by preventing oil from interacting with the exterior surface of a material. In this paper, the authors describe a new type of coating for metal surfaces that is easy to apply and extremely oil-repellent. To make the oleophobic coating, the researchers used a naturally occurring chemical, tannic acid (TA), which is found in many plants (Figure 1A). Tannic acid is a polyphenol (meaning it is made up of many repeating phenol groups) and can interact strongly with many metals. The researchers took advantage of this feature by dipping various metals in solutions of tannic acid, forming a coat of tannic acid on the surface of the metal. This coating made the metal more oleophobic, especially when underwater. Figure 1: A) Structure of tannic acid. B) Cartoon of how contact angle is measured. C) Drop of oil on tannic acid-coated copper surface showing high oleophobicity (and high contact angle). Adapted from Chen, Y.; Meng, J.; Zhu, Z.; Zhang, F.; Wang, L.; Gu, Z.; Wang, S. Langmuir 2018, 34 (21), 6063-6069. Copyright 2018 American Chemical Society. , uses a camera to measure the angle formed by a drop of a liquid on a flat, solid surface (Figure 1B). If the surface repels the liquid (like an oleophobic surface and oil), the drop minimizes its contact with the surface, producing a large contact angle (Figure 1C). 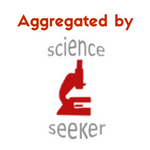 If the liquid has an affinity for the surface, the contact angle is low. The authors also measured the adhesive force, which describes how strongly the liquid adheres to the surface. For an oleophobic material, the adhesive force should be very low because oil should not stick to the surface. The researchers tested these physical properties for the oil 1,2-dichloroethane on copper surfaces that had been coated with tannic acid under a variety of conditions. They found that even with low concentrations of TA and short exposure times, the contact angle was high and the adhesive force was low, meaning that the copper surface became strongly oleophobic (Figure 2). They also tested the pH of the solution used to treat the copper and found that the process worked within a pH range from 3 (acidic) to 10 (basic). 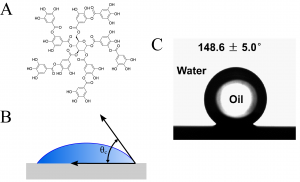 Figure 2: Effect of tannic acid concentration (A) and exposure time (B) on the oleophobicity of the final surface, measured by contact angle and adhesive force. Adapted from Chen, Y.; Meng, J.; Zhu, Z.; Zhang, F.; Wang, L.; Gu, Z.; Wang, S. Langmuir 2018, 34 (21), 6063-6069. Copyright 2018 American Chemical Society. The authors then demonstrated that the tannic acid coating could be applied to many different metals, including copper, titanium, nickel, zinc, and iron. To make sure that oil could be cleaned off of the surface, they dipped both bare (untreated) and tannic acid-coated metal sheets in oil with a red dye. If the metals were not coated with tannic acid, the oil would stain them dark red (Figure 3, second column). With the tannic acid coating, the oil could be washed off completely, as seen by the lack of red staining (Figure 3, fifth column). This experiment showed that the coating could be used in a practical situation in order to repel oil that would otherwise stick to the surface. 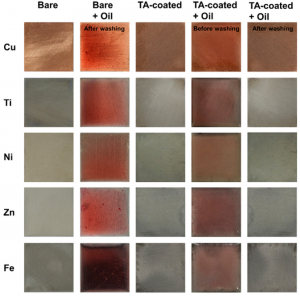 Figure 3: Effect of tannic acid (TA) coating on different metal surfaces shown by dripping sheets in red-dyed oil and washing. Adapted from Chen, Y.; Meng, J.; Zhu, Z.; Zhang, F.; Wang, L.; Gu, Z.; Wang, S. Langmuir 2018, 34 (21), 6063-6069. Copyright 2018 American Chemical Society. This new type of oil-repelling coating is easy to apply and only requires tannic acid, an inexpensive, naturally-occurring chemical. That makes this technique ideal for the future development new methods to prevent and clean oil pollution in the ocean! Adding a simple coating of tannic acid to the surface of boats or the tools used for oil clean-up could help make them even more effective!